Sathyan Anthikad 's Bhagyadevatha completed five weeks in theater.Initial days the collection was not that high , but after three four days , again mouth publicity comes into play for a Sathyan Anthikad film.Family audience got what they expected from a Sathyan Anthikad movie. Yes , as i mentioned in one of my posts , it was a treat for all sathyan sir fans. When a new cinemateographer comes for the first time for a Sathyan Anthikad film , they will do the level best.For many years , Vipin Mohan was the cameraman for Sathyan Anthikad films. When Azhagappan did camera for "Manassinakkare " , it was well appreciated all over the place. 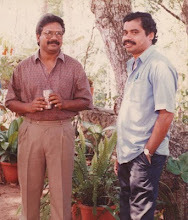 Then S.Kumar for the first time did the camera work with Sathyan Anthikad for "Vinodayathra". As you all know how beautiful for that. Now the veteran cameraman Venu for the first time did the camera work for Bhagyadevatha , and it was outstanding , especially the boat scenes. All cameramen were waiting for a chance in Sathyan Anthikad film . Who is next ? Let us wait and see.